Bojan – What’s The Deal? Being a 20-year-old next ‘wonderkid’ forward for Barca is a pretty good achievement, sure, but being at the club now for many seasons, and a handful as a first team player, Bojan has in fact been progressively getting worse. I’m sure everyone has an opinion on Bojan, and bursting onto the scene as an excellent 17-year-old, he was supposed to be the next big thing out of the La Masia. the hype was at its peak when Bojan scored a goal with the first team in a friendly against Egyptian side Al Ahly as a 17-year-old. He then featured in the 2007-2008 season where Rijkaard played him in 48 matches and become the youngest player ever in club history to feature in a league match and to score a goal. 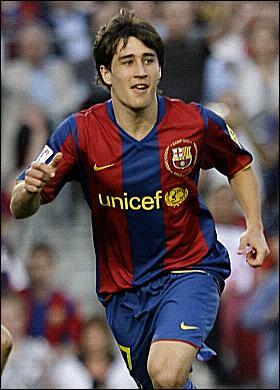 Overall, Bojan was one of the bright spots for Barça in that disappointing 2007-2008 season. Bojan had a pretty impressive debut season by scoring 12 goals in all competitions. Not bad at all for a 17-year-old competing with Messi, Eto’o and Henry for minutes. 2008-2009 Pep took over and with the front of Henry, Eto’o, Messi we plundered over 100 goals for and won the treble. Bojan played 40 competitive matches that season and only scored 2 league goals, the others coming from the Copa Del Rey in which he found himself being a more ‘specialist’ player for. Last season he scored 12 goals, and not a bad haul of 8 league goals in limited appearances due to Ibra coming in the side. Bojan has made 26 appearances this season, and has only scored 4 times, 2 of them coming in the 8-0 blowout against Almeria which was basically a training drill of a game in the end. With Pedro established and showing his proven goalscoring form, Bojan was never going to get a look in over Messi/Villa. So to the Copa Del Rey, his supposed ‘speciality’ and the real chances for him to shine – and he has failed – scoring only 1 goal. Recent performances by Bojan have shown us a player who is frustrated and low on confidence. There has always been talk that he should be loaned out, and I for one support this stance. However it must be said that not every “next big thing” eventually turns out that way. Remember Gio Dos Santos? or Freddy Adu over in the US? Sure, at 20, Bojan still has time, however, FC Barcelona needs their first team players to be ready. Can we depend on him in case Pedro, Villa or Messi get hurt? If that happens, then we are depending on a rusty player who is short on confidence. The only remedy is playing fulltime but with this team, who do you dare to bench? Unless Pedro goes through a cold streak, Bojan is going to find minutes hard to come by. So Guardiola and the club have to decide what to do with Bojan for next season. Rarely do clubs have to worry about 20-year-old phenoms on their team. Unfortunately, Bojan’s case is a rare one where a loan away from the club might just do him good if he ever expects a long-term future with the team. He has the contract extension until 2015 – but even with that security he seems totally short on confidence and just how long can you persist with a player, no matter what his skills are – correct me if I’m wrong but his job is to score goals and ultimately he has to be judged on this. As I said before, Personally I like Bojan and really want him to succeed but even my patience is getting thin. A loan to say, a French or German club may be in his best interest and if he doesn’t seem to be doing well with a change of scenery, then perhaps it’s best if we look to offload him. What do you guys think about Bojan…what would you like to see done? This entry was posted in Bojan. Bookmark the permalink. 11 Responses to Bojan – What’s The Deal? The case of Bojan is pretty frustrating, so much talent but the boy seems to suffer from too much anxiety when he plays. If only he could relax a bit more. We saw that Bojan does have the level in the last few games of last season when he came in for Ibrahimovic, but he hasn’t been able to build on that. I agree that a loan out would probably be best, now that we have Afellay – who looks like being first choice back-up for our front three of Villa, Messi and Pedro – I think we can afford to let him gain experience somewhere else. Confidence can be a fickle and fragile thing. All it takes is a sequence of words, a bad game, a gesture, and the thing can spiral in on itself. Rijkaard was very encouraging with Bojan in particular towards the end of his tenure as Barça’s coach, and it showed in the kid’s performance. When Pep took over, however, Bojan was not given anywhere near as much time on the pitch as under Rijkaard. It almost felt like Pep was trying to undo what Rijkaard had set in motion, perhaps due to fears that Bojan was still too inexperienced for the wiles of La Liga. I do remember that even under Rijkaard it didn’t take much for a defender to get under Bojan’s skin. All it took was a cynical trip or tug of the shirt and Bojan would be visibly upset at the treatment. That could have been why Pep held him back in the beginning. Unfortunately, how do you hold back someone who has already been let loose a little with the first team? It seems one malady was replaced with another. In trying to avoid too rough handling with Bojan too soon by more experienced defenders, Pep may have left Bojan to suspect the coach didn’t trust in his innate abilities. Confidence is built on trust and if Bojan did, in fact, feel Pep may have lost trust, then it’s possible the boy has taken a particularly nasty path to date. It’s sad to realize this may be the case. Bojan possesses a clinical technique with his shots which are powerful and accurate. I truly hope he can turn this around. I don’t think it’s so much a case of Guardiola holding Bojan back, it’s more simple, he plays the best team and Bojan rarely forms part of that. The last year under Rijkaard we had loads of injuries to our forwards, it was the year of the fantastic four of Henry, Ronaldinho, Eto’o and Messi, but after the first couple of games I don’t think there was ever a time when all four were fit, and the form of Ronaldinho and Henry when they did play was well below there best; that’s why Bojan got his chance and also because he played pretty damn well that first season. Since then he has only really taken the chance he got at the end of last season, apart from that he has more often than not been disappointing. Also with the current form of Messi, Pedro and Villa, only a fool would break that up to give “a chance” to Bojan, (or to Afellay or Jeffren or anyone come to think of it). It’s unfortunate that we will as we get to the business end of the season – likely with few second legs of ties with leads impossible for our opponents to overcome – we will not get much of a chance to see some of our second tier players. Having not watched a few of our recent games I’m particularly disappointed not to see more of Afellay who seems to have hit the ground running (or dribbling (the football that is)). Sadly my two cents are also towards loaning him out. I think he does need to develop that toughness and what he really needs is match time if he is to regain confidence. Also, time away in a foreign league (and the challenges of moving to a new country and adapting to a new language) might also toughen him up some (whilst coming through La Masia can provide stability, understanding of a philosophy and immense belief in the club, it is also a cloistered existence and for some players, perhaps particularly strikers, that may not be a good thing). Finally, if Bojan lacks the strength ultimately to make it as a striker – however much iron he has been pushing recently, he still goes down far too easily – the club should look to consider developing other attributes with a view towards other positions. I’ve thought for a while that Bojan needs to be lent out to another club. Unless he can develop himself, he’s going to have an extremely hard time. Villa may only have a few years left, but La Masia is a factory that is producing more talent than Barcelona knows what to do with. Even if there were an opening in the front, would Bojan get a place before Jeffren? I’m leaning toward no. And then there are other players, who may not be forwards per se, but who may cause Pep to change the shape of the team to accommodate them: Afellay sure, but also Thiago, Nolito, maybe one day Rafinha, and, of course, the once-and-future-Cesc. I don’t know. He has to win a battle against himself. This isn’t Pep’s fault or anyone else’s. He plays like he has no confidence. You know who else I’m close to ready to give up on? Cesc. Sure, he’s a completely different situation. But I think we reward those who haven’t left the system (like Thiago) as opposed to setting a precident that “there is always a way home” even if you say dumb stuff sometimes and sigh new contracts hoping that your hometown club will come pay any price to get you back. The real player on Arsenal’s team is Nasri, anyway. If Barca pays a lot of money for someone from Arsenal, that’s who I’d want us to go for. It’s a frustrating situation sure, but Bojan can do the job, as he has showed in his 1st season and last season when he got a run of games near the end and scored when Ibra was useless. So he can do it all he needs to do is believe in himself and take the opportunities he is given. But so I do think a loan move might benefit him (e.g Santander) were he can play often and develop quicker. £20 million might be hard to pass at this point. Although I would like to see him get loaned as well. Maybe a Dutch team where he can find the back of the net and regain confidence. I don’t think he will last as far as England goes I he is no where mear strong enough or threating enough. I agree w/ Caleb as well enough w/ Cesc I want him as much as the next person but w/our financial situation I would reather us secure Alves Sigature. Alves brings so much to this team and just the way he plays w/messi alone is worth his presence. Maybe we will get to see some more affelley this week considering the arsenal game is right around the corner (hope puyol is fit I read today that he is questionable). Why not bust Bojan back to Barca B? Let him be a big fish in a little pond, get minutes and goals flowing again. Call him up periodically for the senior squad as needed, basically just have him play for both teams. Remember, he is only 20 years old. Players like Messi and Pedro are both 23 years old. Affelay is 24; I’m 23 years old and I feel 1000 times more in control with my body now then when I was 20. Bojan needs to hit the weight room a bit, and the confidence will come as the physicality of the game will not be as big a factor.